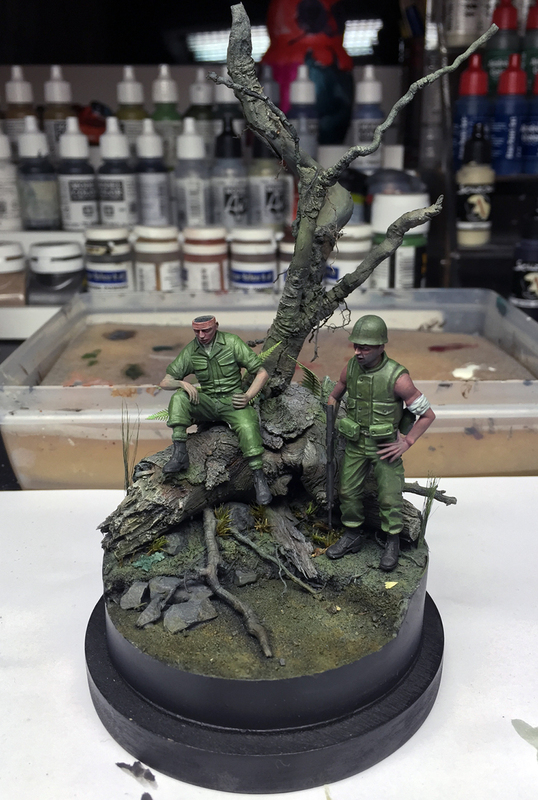 I got asked to share the steps on the Vietnam base in 1/35 scale so I might as well give it a go while I´ll still remember some things. I don´t remember the color mixes exactly and I might have missed a color here and there but I´ll try my best to write it as accurate that I can remember. 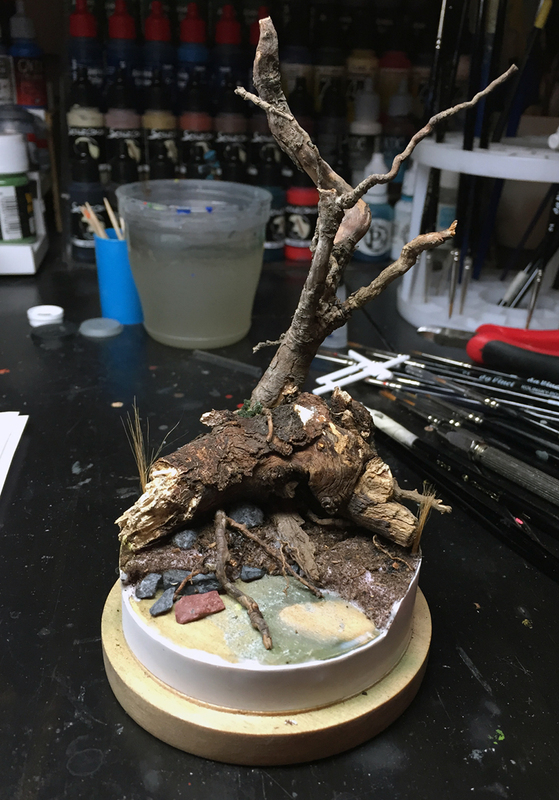 I started of with a piece of wood that I found in the forrest and some rots that I collected last summer and placed them on a piece of wood that I will use for the base. My initial plan was to make a fallen tree near water and with another tree grooving in the background. 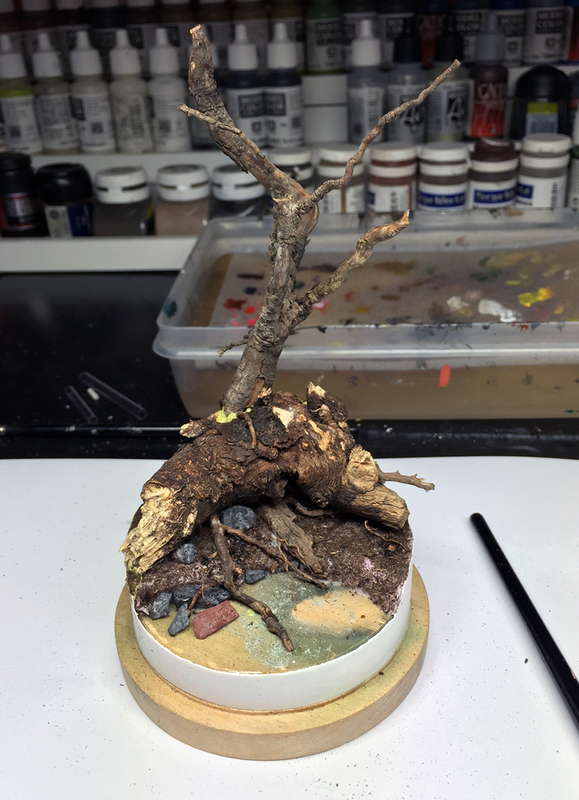 I then glued the pieces together using superglue, in this stage I also added a rot that will later go into the water. 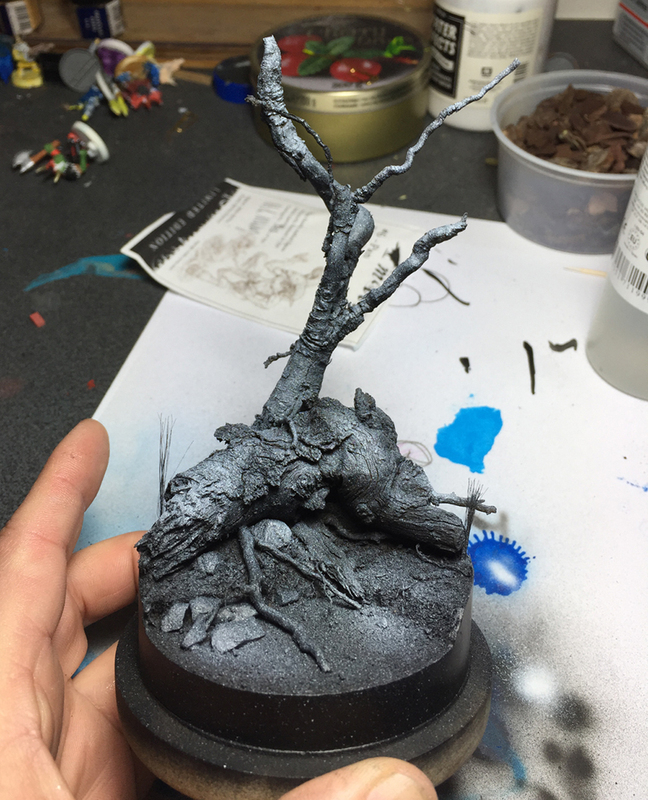 I glued some plastic styrodur to the base to make the basic structure of the ground, do not use superglue on the styrodur, it will melt! Then it was time to add some larger stones. 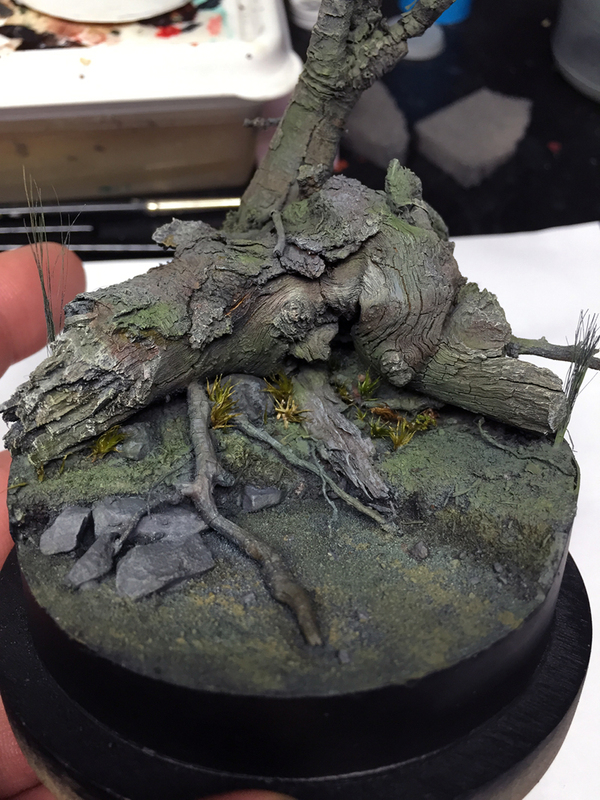 I added some texture on the ground using common earth and a few pieces of bark that I had lying around. I also took some flax who will be long grass. 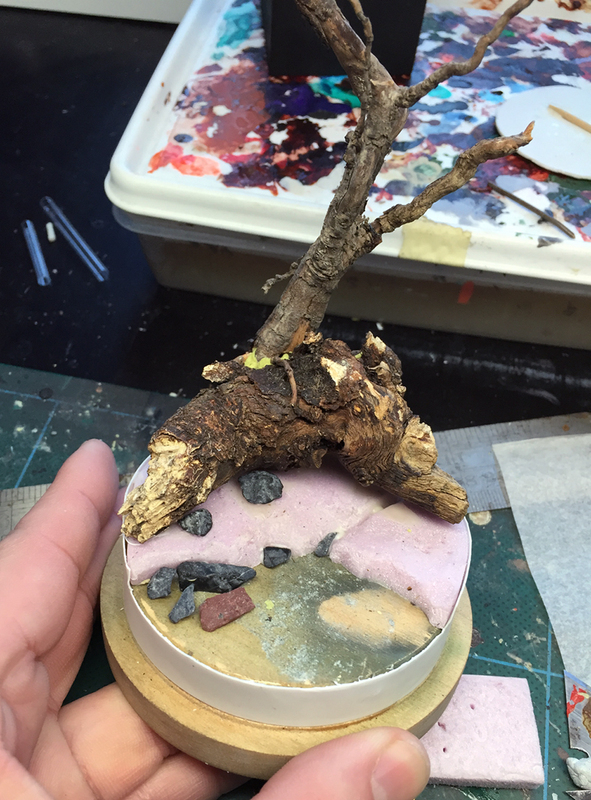 The flax was glued together using PVA glue and then superglued to the base once the PVA was dry. Primed using black and white. 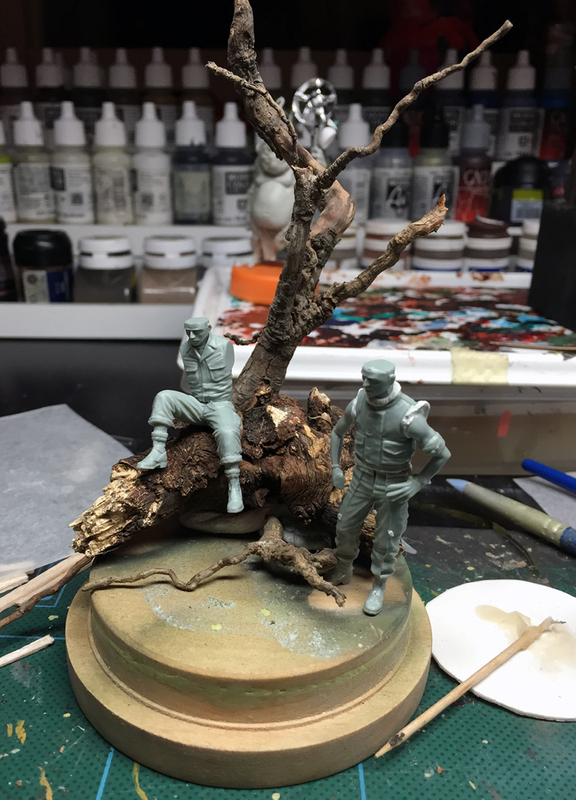 Now it was time to put the basic colors on the base using my airbrush (for speed). 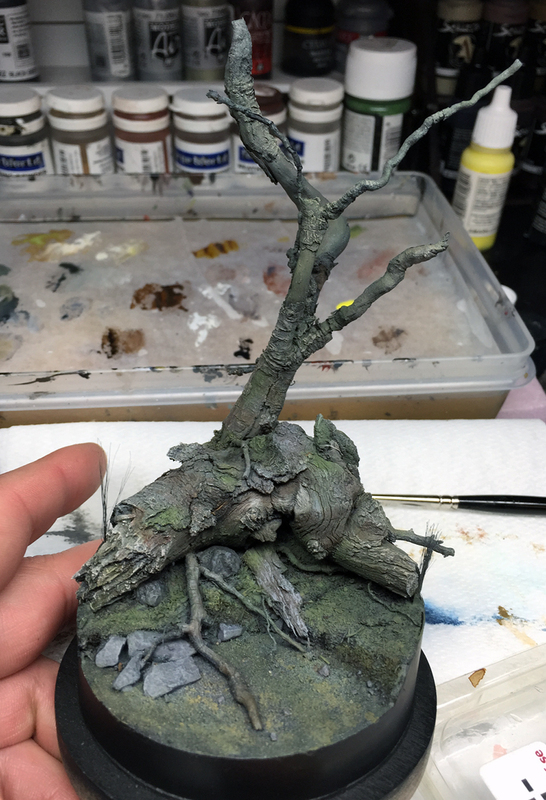 I used this colors and started with a grey/brown base and added some Khaki and green to create some light and moss. 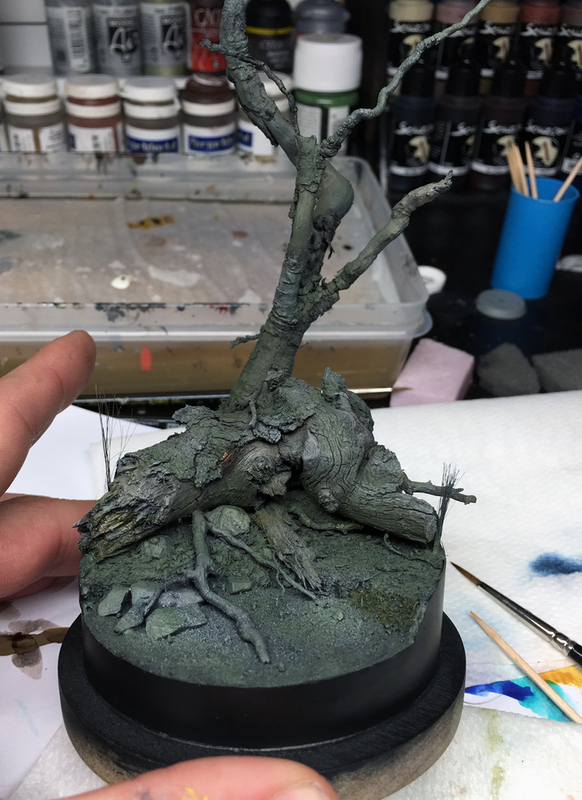 The base hade a brown base with some green sprayed over it. 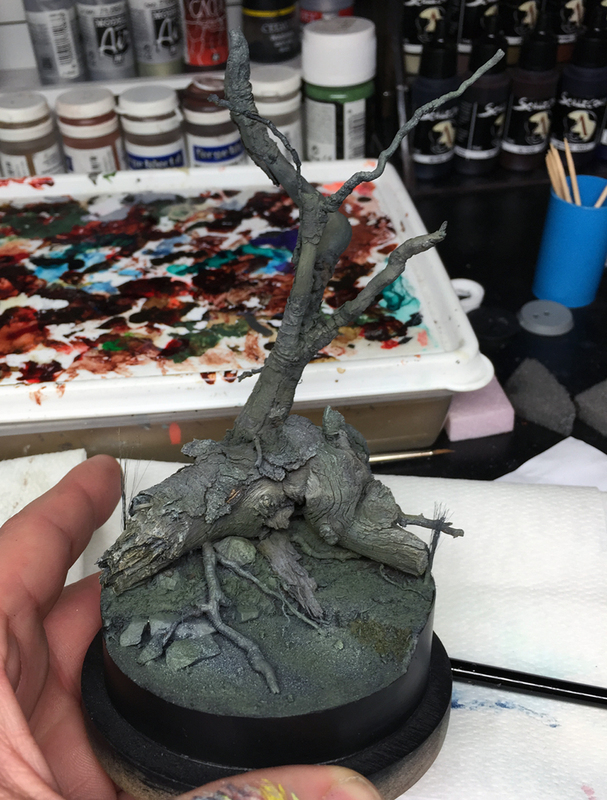 I stared to pic out the highlights on the tree with some greyish tones. I also did some more shadows using Inktense wood by Scale 75. Using Reflective green from Vallejo I painted the places I wanted to have some moss, I highlighted those places by adding yellow to the green. 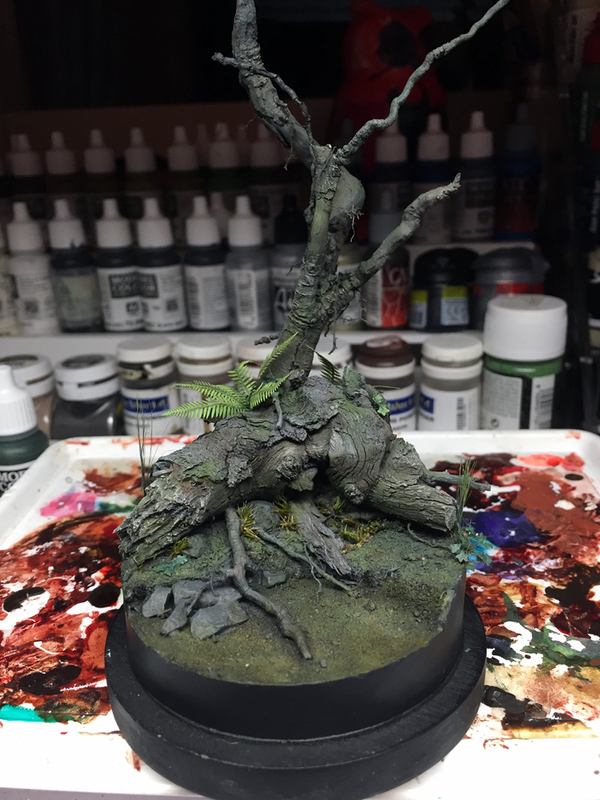 At this point I also started to place some real moss on the base. I used matte varnish to stick them in place. 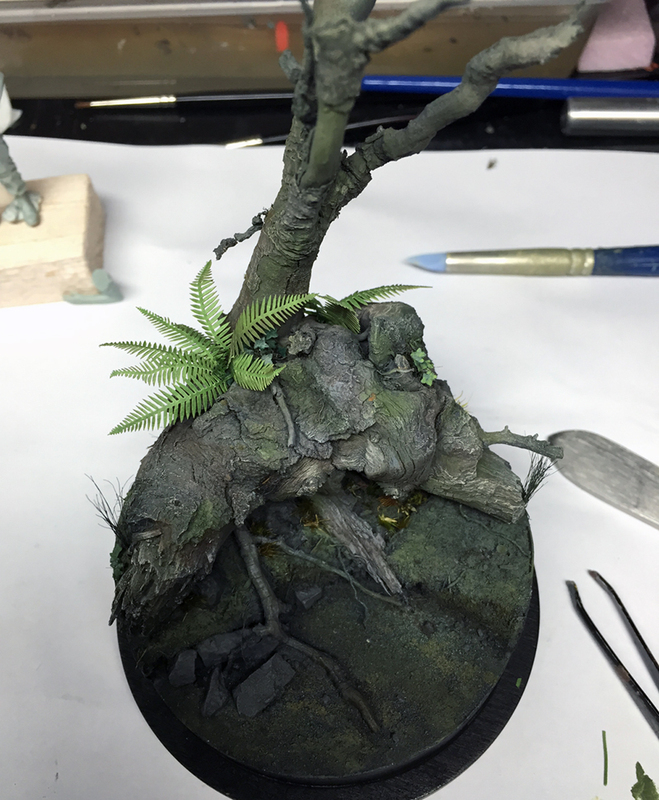 Using laser cut paper fern from Green line I added some more vegetation to the base. The fern was painted with reflective green and highlighted with yellow. 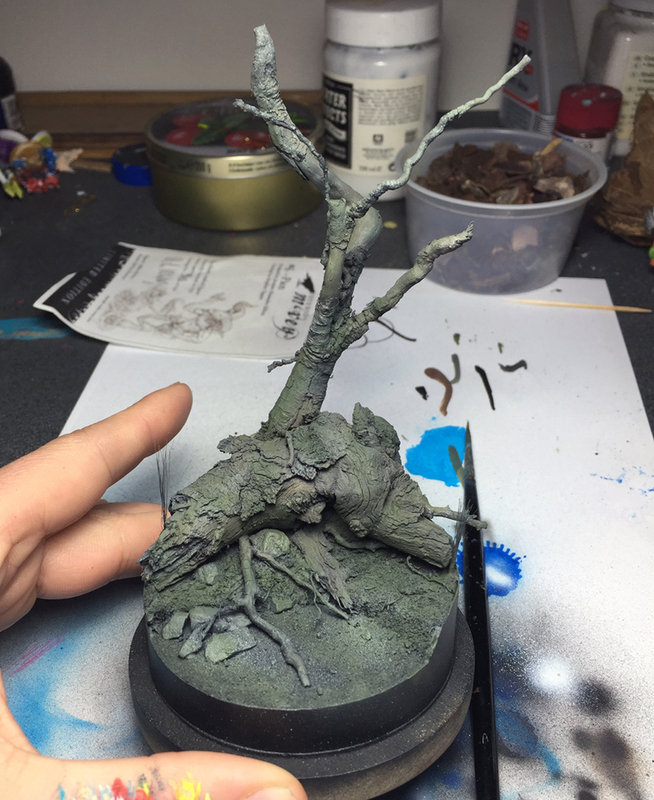 Something was still missing on the base so I took some Ivy from Mini-Natur and placed it on the base, I also repainted the leafs of the ivy to a much brigher green. Using very small pieces of rots I did some hanging rots from the tree, later on painted with a green/grey tone (I think it was the bastone from the field grey paint set from Andrea). 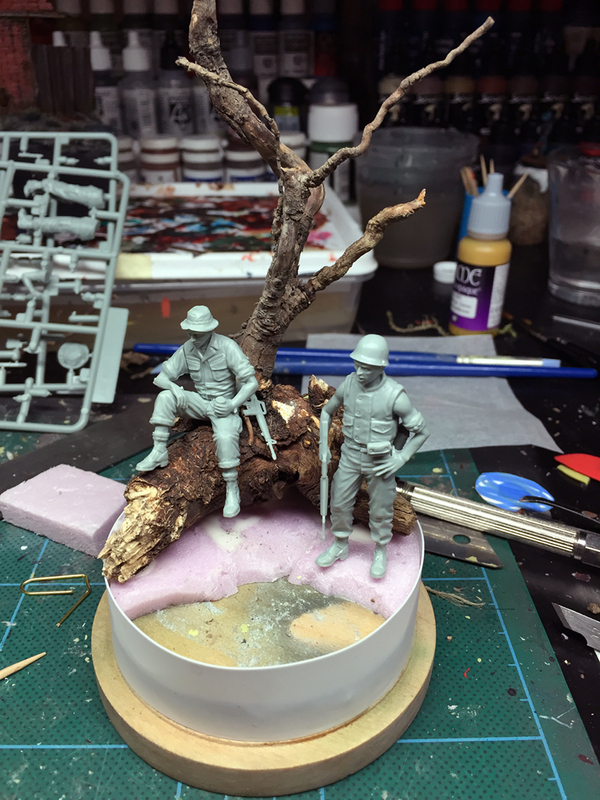 I also started to paint the miniatures that i haved in mind for this pice, they are still not done in this pic. 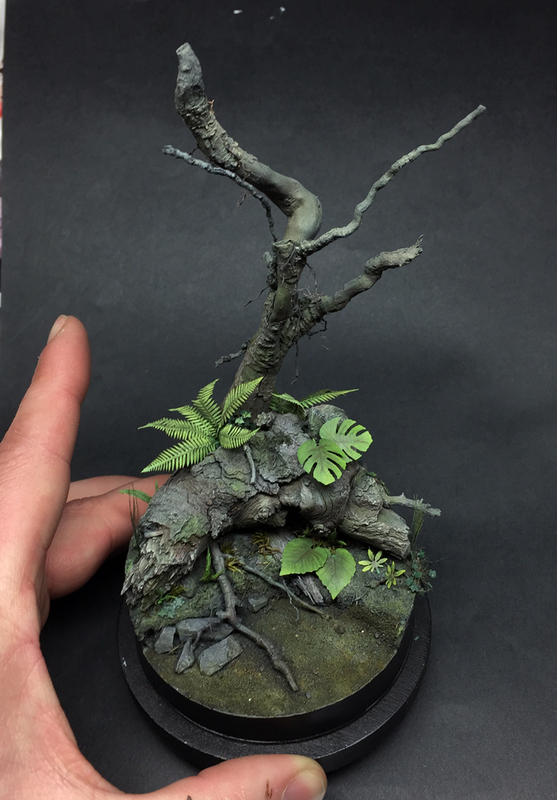 I wanted to have more vegetation on the base so I took some paper plants from J´s work and decided to repaint them (since they where printed in color). 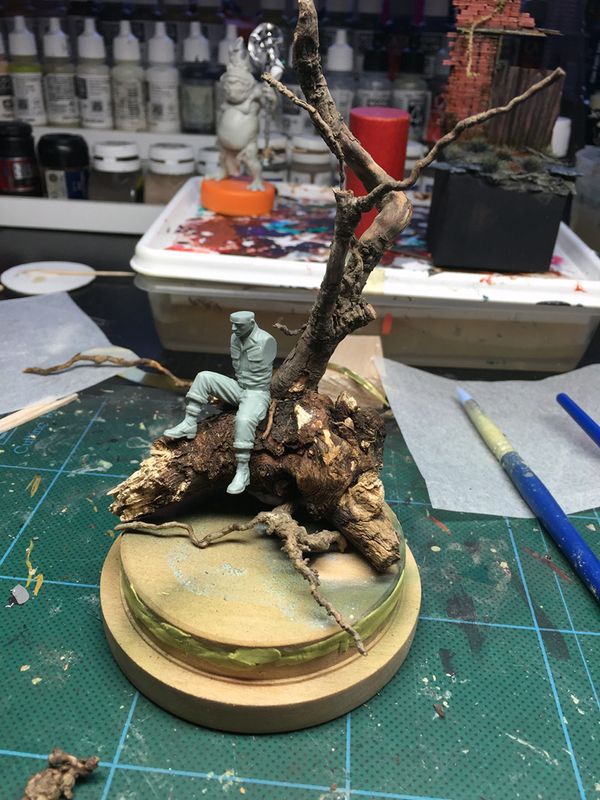 And this is how it look´s at the moment, It still needs the water and some more work on both the ground and the tree before placing some miniatures there. But I´m slowly getting there!